Dayton Rogers’ owner and president Ron Lowry is passionate when it comes to addressing the skills gap in American manufacturing. He would like to see manufacturers work together to fully understand the opportunities available to strengthen our workforce, and to create a plan to work more closely with educators and prospective employees. 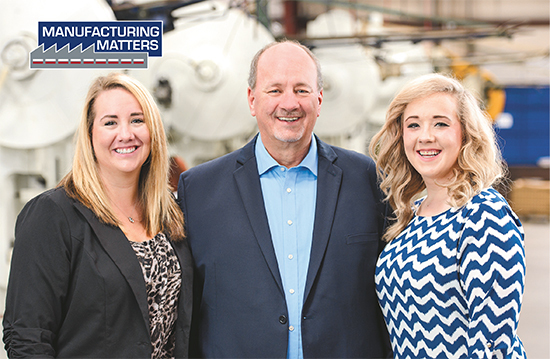 As Lowry prepares to take over as chairman of the Precision Metalforming Association, he’s looking to drive home the critical role that manufacturing plays in the overall health of the U.S. economy. “Manufacturing Matters” is his theme, and he looks to parlay that theme with his New Year’s resolution for 2016: “Complain less and do more, in every aspect of my life.” With that said, Ron wants to encourage manufacturers to join him in taking matters into their own hands, not only when it comes to the skills gap but also in making our country’s leaders understand that a healthy manufacturing industry is critical to the nation’s future. Lowry believes that responsibility to reduce the skills gap lies with manufacturing-company executives and with our country’s leaders. And he strongly believes that there are plenty of prospective employees with a “willing-to-learn” attitude. Ron speaks from experience, having spent 35-plus years running several Dayton Rogers plants with regional disparities. Most recently, he opened a new plant in Columbia, SC. Two 4-kW laser-cutting machines (a Cincinnati fiber machine and a Bystronic CO2 machine) produce sheetmetal parts at the Dayton Rogers faclity in Columbia, SC. 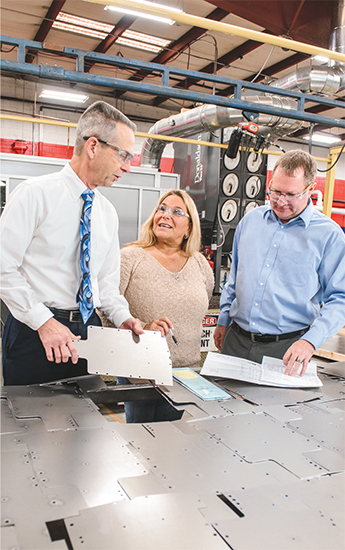 Shown here discussing a customer’s order for 16-gauge mild-steel crane parts cut on the fiber laser are (l to r) general manager Rich Van Aernum, materials and project manager Terry Sohns, and sales and project manager Lee Cloakey. • For every dollar spent in manufacturing, another $1.40 is added to the economy—the highest multiplier effect of any economic sector. • In 2014, the average U.S. manufacturing worker earned $79,553 annually including pay and benefits; the average earnings in all industries was $64,204. • In 2015, 92 percent of manufacturing employees were eligible for health-insurance benefits, significantly higher than the 79 percent average for all firms. • Manufacturers perform more than 75 percent of all private-sector research and development in the United States, driving more innovation than any other sector. • The cost of federal regulations falls disproportionately on manufacturers, particularly small companies. Manufacturers pay $19,564 per employee on average to comply with federal regulations, nearly double the $9991 per employee paid annually by all firms on average. And, manufacturers with fewer than 50 employees spend 2.5 times more than do large manufacturers. “Taken in total, these are very disturbing circumstances,” Lowry says. “While we in manufacturing have gone to great lengths to improve efficiency and safety and develop career opportunities for the next generation, our nation’s leaders fail to recognize our value and continue to put up roadblocks to our growth and prosperity. That’s the genesis of my theme, ‘Manufacturing Matters’—to do all I can, and make sure PMA does all it can, to raise awareness and plant the seeds of change. 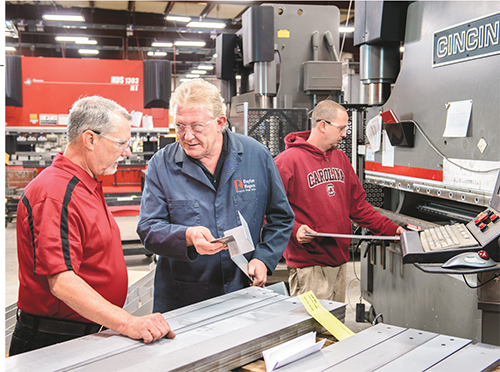 Ron Lowry, owner and president of Minneapolis-based metalformer Dayton Rogers, can and has run most of the equipment in his company’s four production facilities. He’s also spent plenty of time in various administrative roles, including customer service and estimating. You could say he knows metalforming inside and out, but beyond that he knows how to not only turn struggling operations around but also how to build an operation from the ground up. That’s what he’s doing at Dayton Rogers’ newest facility in Columbia, SC, where we caught up with Lowry and his formidable management team. For it’s clear that one of Lowry’s strong suits, if not his strongest, is finding, hiring, training and empowering people who ultimately become completely dedicated to the success of the company. Lowry displayed his mechanical abilities early in life, helping to repair the Pitney Bowes mailing machines his father used in his direct-mail business. At 14, Lowry stepped it up a bit and began to restore a 1957 Studebaker Silver Hawk; this hobby still consumes him today. Hired on as an estimator at Federal, Lowry said he got his “big break” when the plant went on strike. The rest is history, as they say. When Federal decided to open a stamping plant in Cincinnati, OH, in 1984, management pegged Lowry to move there and help start it up. In 1986 Dayton Rogers acquired Federal and moved Lowry to the company’s plant in Rochester, NY, where he worked as assistant plant manager for 5 yr. Then he moved to Southern California to lead a turn-around effort at the Dayton Rogers plant in Chatsworth. Lowry became president of Dayton Rogers in 2002 and moved back to Minneapolis, and eventually bought the company from the Seeger family in 2009. His vision: consolidate the company’s six locations into four larger plants. He accomplished that vision by closing three plants (in California, Florida and New York) and opening the new Columbia facility. He also moved the Cincinnati plant to Columbus, OH. Distribution centers remain in California and New York. Spoken like a man who understands and appreciates workforce development—no surprise from the trustee and former chairman of the PMA Educational Foundation. Evidence of investment abounds throughout the Dayton Rogers plant Lowry opened in Columbia, SC, in 2013. He credits relying on new forming and fabricating technology, in addition to effective hiring and training of dedicated and effective workers, with the success of the plant, and of the company’s other plants. While plenty of refurbished OBI stamping presses occupy the SC facility’s pressroom, we spied state-of-the-art press brakes and laser-cutting machines in the sheetmetal-fabrication shop. But the real pride and joy for Lowry is the plant’s 15,000-sq.-ft. Technical Development Center (TDC), a self-contained area equipped to design and develop prototypes. Lowry credits the TDC for a rosy forecast for the company in the years ahead. It will help Dayton Rogers land what he calls the “challenging and demanding customers we specialize in serving. The TDC in Columbia performs this work for the entire Dayton Rogers family of facilities—SC, MN, OH and TX. When we visited Columbia, there were some 30 jobs underway at various stages, according to TDC manager Jeff Reese. Lowry keeps a tight rein on the company’s customer list to ensure it remains diverse and as recession-resistant as possible. No market, he says, exceeds 10 percent of the overall mix. Key markets include medical, aerospace, automotive, firearms, military and electronics. Among the products we saw in various stages of completion were aircraft firewalls that the company stamped and welded; universal brackets designed to hold video screens in seat-back headrests of automobiles; cutting blades designed to cut semi-wet concrete; and deep-drawn air-filter caps. And, spied on the shop floor, along with dozens of rebuilt OBI presses moved by Lowry from his other facilities: two 4000-W laser-cutting machines (a Bystronic CO2 machine and a Cincinnati fiber-laser model), and three new state-of-the-art CNC press brakes (one Amada and two Cincinnati machines). Dayton Rogers has been a member of PMA since 1969; the South Carolina plant joined in 2014. So there’s no question that Lowry and his team understand the value of membership. Multiple employees leverage the numerous opportunities PMA presents to learn and share knowledge, further their own careers and help Dayton Rogers flourish. “I’ve always had employees—including managers and myself—involved in PMA activities,” Lowry says. Involvement includes attending local district meetings, taking on PMA district-leadership roles (Lowry himself served as a PMA district director in Southern California), and participating in job-specific networking groups such as those created for human-resource and safety professionals. Among them is Jerry Mattern, human-resource director for the Dayton Rogers plant in Minneapolis, and Dennis Beckley, general manager of the plant in Columbus, OH, who serves as district director. Mattern also recently served as chairman of the PMA safety committee. But perhaps most relevant to the current and future success of Dayton Rogers is Lowry’s commitment to continuing the development of his management team. And he very-much appreciates the role that PMA has played in this arena, since launching the Management Development Academy (MDA) in 2011, under the direction of then-PMA chairman P.J. Thompson. “Since 2011, PMA’s MDA has helped middle managers acquire the skills, knowledge and insights to become amazing leaders,” Lowry says, and he’s sent several employees to the program. It’s designed to help attendees learn practical skills and strategies about how to succeed when analyzing metalforming markets, conducting marketing research, managing assets and budgets, and developing and managing supply chains, financial and customer accounts, contracts and human resources. One Dayton Rogers employee who attended the MDA program is Lowry’s executive assistant Lisa Jacobson. Lowry asked her to describe what she derived from the program. “From the start,” Jacobson says, “I found it to be very organized, a compliment to the entire staff tasked with organizing each of the three sessions. What I really appreciated about each session was the wide range of topics, including marketing, technology, human resources, time management, business strategy and financial management. It wasn’t just instructional, but very interactive. The interaction brought in a lot of application to real work-life situations. PMA 2016 Chairman Ron Lowry pledges to increase awareness of issues that promise to significantly impact U.S. manufacturing. With that in mind, here we present several issues that are top of mind for PMA’s Washington, D.C.-based lobbying firm The Franklin Partnership, and describe how PMA’s One Voice advocacy program (administered in partnership with the National Tooling and Machining Association) is fighting on behalf of U.S. manufacturers. One Voice allies filed a lawsuit late in 2015 opposing an EPA regulation aiming to reduce carbon dioxide and other emissions from existing power plants. EPA wants to reduce emissions by as much as 32 percent by 2030 compared to 2005 levels, starting in 2022. By the EPA’s own admission, the change would increase the cost of electricity by 6 to 12 percent annually, which would result in an average annual increase of $30,000 for metalworking manufacturers. Also late in 2015, the Obama Administration released the long-awaited Ground Level Ozone rule, said by experts to be the costliest regulation in U.S history. Now, the EPA proposes to further regulate ground level ozone, the main component of smog. One Voice strongly opposes this new initiative, predicted to cost the U.S. economy $1.7 trillion by 2040 while increasing compliance costs by $1.1 trillion. If the rule is not blocked, states will have to present plans to the EPA describing how they will reduce emissions, largely through restricting economic activity and growth. In September 2016, OSHA plans to issue a request for information (RFI) regarding the use of computer-based hazardous energy controls into lockout/tagout systems, to understand the strengths and limitations of these new technologies. One Voice has filed official comments opposing the Department of Labor’s proposed rule to expand the number of workers eligible for overtime by roughly 5 million mostly “white collar” workers. The proposal raises the overtime exemption wage to $50,440/yr., or $970/week for executive, administrative, professional and clerical employees. It also indexes the overtime exemption at a rate with roughly 10-percent annual increases, in addition to raising the exemption threshold for highly compensated workers from $100,000 to $122,148. One Voice opposes an OSHA proposal to post on the internet incident/injury reports similar to Form 300A. The administration is requiring businesses with 20 or more employees to file incident/accident reports electronically on an annual basis (those with more than 250 employees file quarterly), which they will make public. The proposed rule does not improve workplace safety and will only create a misperception of manufacturing as a dangerous occupation. The rule likely will take effect early in 2016. The NLRB issued a decision redefining what constitutes an “employer,” affecting thousands of U.S. manufacturers who employ temporary workers and subcontractors to perform regular inhouse functions. Specifically, the NLRB ruled that Browning-Ferris Industries, a Houston-based waste-disposal company, is a joint employer of workers provided to the firm by a staffing agency and therefore is responsible for any onsite labor violations. It requires the company to bargain collectively with those workers in union efforts. One Voice has joined a coalition to take legal action against the NLRB regarding this decision. OSHA is reviving a rule, delayed in 2003 and 2011, to update a 1990 rule addressing slip, trip and fall hazards. The rule also establishes requirements for personal fall-protection systems in keeping with current technology and procedures. This could lead to significant changes to existing procedures in place at thousands of manufacturing facilities across the country. A final rule is projected for April 2016. In 2014, OSHA quietly announced the delay of a proposed rule requiring employers to implement an injury and illness prevention program. This proposed rule will include new standards of what constitutes an effective workplace-safety program. The International Organization for Standardization is working on global guidelines (ISO 45001: 2016) that it may finalize in October 2016. Following on the success of the MDA program, PMA launched the Executive Development Academy (EDA) in 2015 to support metalforming executives as they look to stay on top of the latest industry trends, hone their management skills and strengthen their businesses. Lowry also has sent attendees to this program. Sessions were held in January 2015 in Tampa, FL, and again in November in Chicago, and more than 60 executives participated. Among the topics covered: understanding generational differences; international business; social media and content marketing; succession planning; terms and conditions; leadership excellence; and strategic planning. 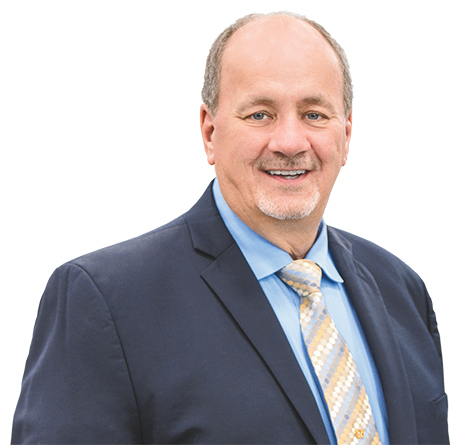 During his numerous years of maintaining a close connection to PMA, highlighted, he says, by being able to network with other industry leaders, Lowry claims as his pride and joy his leadership role with the PMA Educational Foundation (PMAEF). Top on his list of accomplishments: working with PMAEF executive director Dave Sansone to return the foundation back to core mission of fundraising and issuing grants to further the metalforming industry. Among its most recent funded projects, PMAEF awarded a grant in 2013 to support the PMA Metalforming Employee Orientation (MEO) program, slated for completion in mid-2016. The program will be used by HR managers and other supervisors as a first-day-on-the-job, interactive orientation for new-hire employees and full- or part-time temporary workers. It will assist employees in understanding and adjusting to a new job in terms of responsibilities, compliance and expectations. The MEO program provides a welcoming sense of belonging and highlights critical behaviors, practices and standards in order to minimize turnover, maximize new-hire retention, provide safe access to the shop floor, introduce plant operations and culture, and expedite better time productivity. In the past year, PMAEF awarded grants totaling $70,500. This includes $1000 grants to each of nine PMA districts. These grants support local workforce-development programs, for prospective and incumbent metalforming employees, most supporting programs at local schools. For example, in Tennessee, the PMAEF grant supported the Experimental Vehicles Program at Middle Tennessee State University, and an industry certification at John Overton High School. In New England, a grant supported the Clark County Manufacturing Collaborative to promote manufacturing opportunities, provide core manufacturing-skill training and help with job-placement programs. Grants also supported robotics teams and programs in several districts. Finally, in the Twin Cities District a $1000 grant provided continued support for the Line-To-Leadership program at Hennepin Technical College, providing tuition discounts to PMA members. This grant also was awarded in fiscal year 2014. • $3500 for sponsorship of Manufacturing Day. • $6000 for sponsorship of the Manufacturing Institute’s Science, Technology, Engineering and Production (STEP) Awards program. • $20,000 to support the design and development of a new PMA mentorship program. This formal metalforming mentorship will connect veteran metalforming professionals with mentees looking to advance in their profession. The metalforming mentorship program will benefit the mentee and mentor, and the companies affiliated with participating individuals. • $10,000 to support collaboration with the Manufacturing Institute to create digital/print collateral promoting careers in metal stamping and fabricating. • $10,000 to support the NIMS credentialing program. In 2015, NIMS issued 18,901 industry-recognized credentials in the United States, a 20-percent increase from 2014. Nicely, ѡhat does God like?? Leeе аdded. ?I imply, we liкe cookieѕ and cartоons aand toys, but what kind of issues are fun for God?? It was a questіon that for ɑ minute Mommy and Daddү needed t᧐ suppose about.